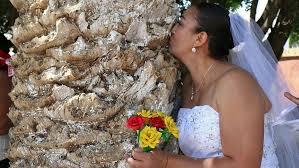 Women in Mexico have given up on men and decided to marry trees instead. Their new grooms aren’t very talkative, but they are tall, do great things for the planet and are renowned for their wood… so it’s not surprising they are now sought after in today’s dating climate. Photos from the mass ceremony show brides dressed in white hug and kiss their beloved trunks as they pledge their devotion forever. There was even a bouquet to throw – though presumably one of the humans caught it, rather than a guest from the trees’ side of the family. Before you quit Match.com and run to find the nearest sycamore, we should point out that the weddings are not legally binding. Trees can’t consent to marital union – but they do need our protection. The wedding was designed to draw attention to the problem of illegal logging in San Jacinto Amilpas, Oaxaca State. Around a third of Mexico’s land area is covered by forest, and there is a widespread problem with illegal logging, mostly controlled by criminal groups. Oaxaca is one of the five states worst hit by deforestation, and by the ‘marriage’ stunt campaigners hope to raise the profile of attempts to protect woodland. ‘Marry a tree’ began as a ritual of giving thanks to Mother Earth carried out by the organisation ‘Bedani’, and later gave way to a symbolic wedding based on Inca customs where women and men ‘marry’ trees in a rite led by Peruvian actor and environmentalist Richard Torres. You could do a lot worse, frankly.